You gotta join us live for our next Lightroom Live, totally free of charge. Not only will you learn terrific techniques, but if you tune in live, you can be entered to win excellent prizes to help you in your work. (Note: MUST BE TUNED IN LIVE TO WIN). We’ll be giving away a copy of Perfectly Clear from Athentech. Plus you never know what else. We kick off Monday, July 18th at 1:00 pm Eastern, 12:00 pm Central, 11:00 am Mountain, and 10:00 am Pacific. 2 pm in the Virgin Islands. Check out the YouTube event here and it’ll show your local time. Black and White photography continues to be a striking way to present pictures, and there are so many ways to make them. 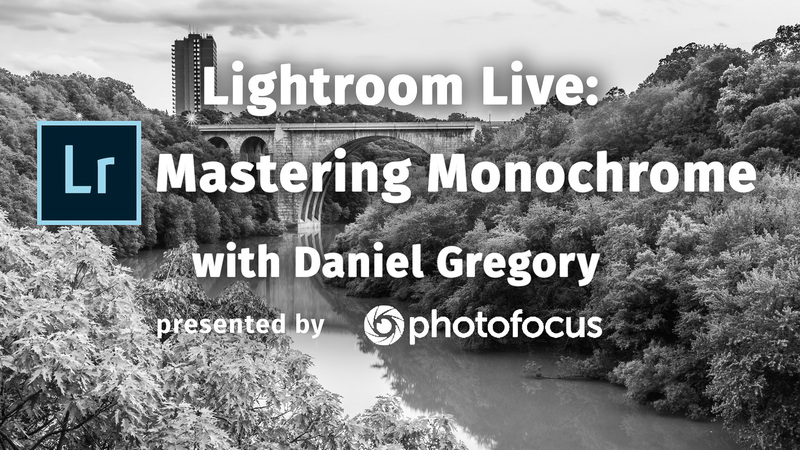 Daniel Gregory is a master of many monochrome methods from Lightroom to Platinum contact printing, and this month he’s going to help us learn fine skills for making striking black and white photographs. Check out some of his work at DanielJGregory.com. Join regular hosts Rob Sylvan and Levi Sim live to ask questions and be entered to win some terrific prizes, too. This episode will be useful for all levels of Lightroom users from beginner to advanced. Tune in Live to enter the drawing for some terrific prizes from our sponsors. Hosts Rob Sylvan and Levi Sim broadcast live every month exploring Lightroom to help you smooth your workflow and finish your photographs with the vision in your mind’s eye. The video will broadcast live right here, and be embedded here forever; but if you want to ask questions and be entered for a prize, you’ve gotta go to the YouTube page here. While you’re waiting for this month’s Lightroom Live, why not catch the replay of last month’s episode?